1 Clean the soup greens (carrot, leek, parsnip) and coarsely chop. Cut the onions in half. Line a pan with a piece of aluminum foil, then add onion halves, cut side down, and char until lightly browned. Squeeze juice from lemon. 2 In a large pot, combine 3 liters of water with the soup greens, charred onions, the bay leaves and 2 teaspoons salt. Bring to a boil. Rinse the veal, pat dry and add to pot. Cook over low heat until veal is cooked through, about 1 1/2 hours. 3 Peal and core the apples and cut into large pieces. In a small saucepan, simmer apples with 1 tablespoon lemon juice, 1 tablespoon water and a pinch of salt, stirring occasionally. Cover and cook until the apple pieces are very soft, stirring often. Remove from heat and let compote cool completely. 4 While the apples cook, wash and peel the carrots and potatoes and cut into 1/2-inch pieces. Place in a bowl with cold salted water to cover. Wash the leek, drain well and cut into 1/2-inch rings. 5 Remove the veal from the pan and keep warm. 6 Strain the broth through a fine sieve, return to pot and bring to a boil. Add potatoes and carrots and cook for 4 minutes. Add leek and cook for an additional 4 minutes. Season with salt and pepper. 7 Wash, peel and finely grate the horseradish. Add to apple compote. Season with salt and pepper. 8 Rinse the chives, shake dry and cut into slices diagonally. Slice boiled veal and divide among soup bowls. 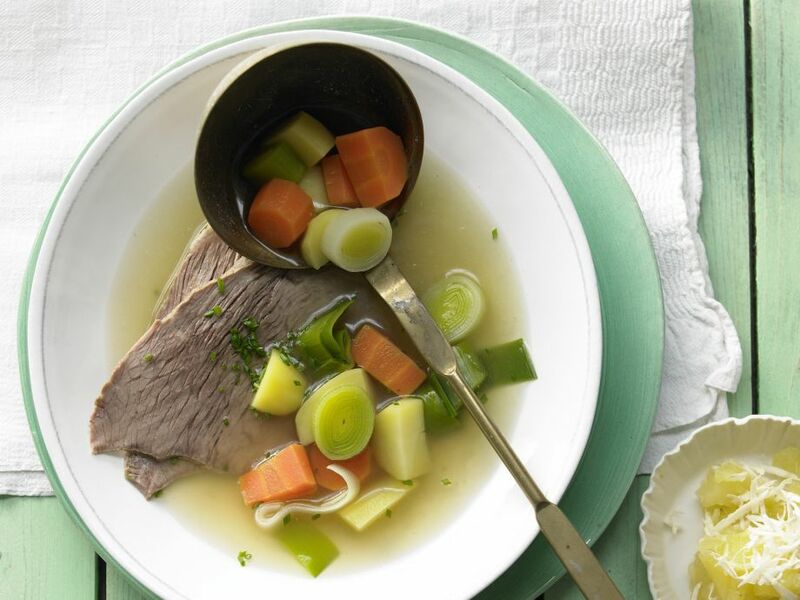 Pour broth and vegetables over veal, sprinkle with chives and serve with apple-horseradish compote.